I’ve already received some great photos and need AS MANY AS POSSIBLE. The shots can be funny, weird, simple. At this stage, I just need variety. We’ll go for the celebrity shots down the road. Every time I see a photo of a man reading, I think: I bet his kids will grow up to become readers. Great idea!! As an educator I throw the challenge out to uncles and grandpas to give you a hand in this effort! how do I send you the photos? Email to: Jamespreller@aol.com with the subject heading, FATHERS READ. Thank you very much for your help. This won’t work with lots and lots of photos. 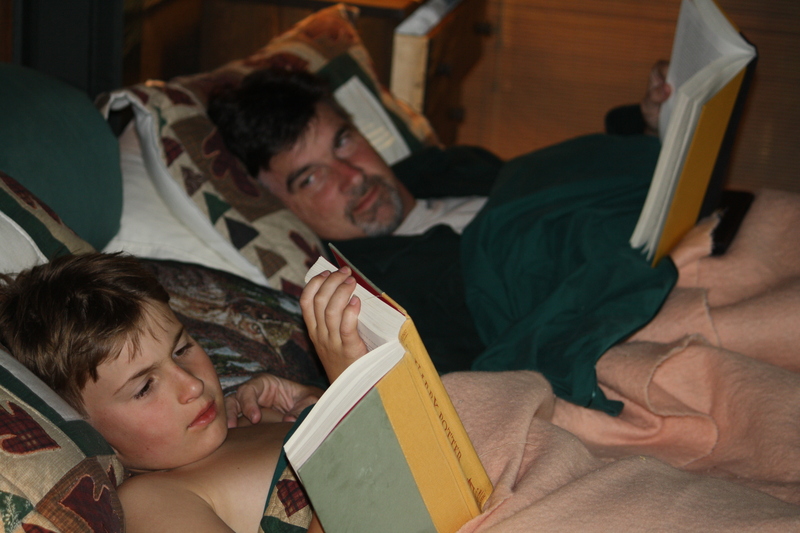 My son Dylan and I read “Bystander” together… it was a great read for both of us for plenty of reasons. For me, I got to revisit some of the uncomfortable situations I experienced myself in grade school, and middle school. I think it helps to do this when trying to understand and manage the complex situations our own kids are dealing with. For Dylan, he got to place himself in a situation that in my mind, sets an example for how a good kid should behave, if faced with similar challenges. Absolutely, Dads, this is a good idea. I have a great photo of my husband reading to our first baby girl and she is wide eyed excited about the book. Will have to hunt for it. Reading is the one escape that costs little but has enormous benefits. Reading to all three of my own kids is a memory that will last a lifetime for each of us…even when the book isn’t so good! Although they have gotten older, I still enjoy reading daily to my class. I have always loved infusing scary voices, dramatic pauses and, when they are on the edge of their seats, pretending that I am done reading for the day. Reading is the one escape that costs so little, but the return is priceless! I volunteer with Read Aloud Delaware and am creating a bulletin board display for the local library. I too am looking for pictures of dad’s reading with children. I already have a lot of women reading. Can you share 3 or 4 that I could print out. I love the one you have on this site. Thanks so much for sharing. Our focus at Read Aloud is reading one on one with children.